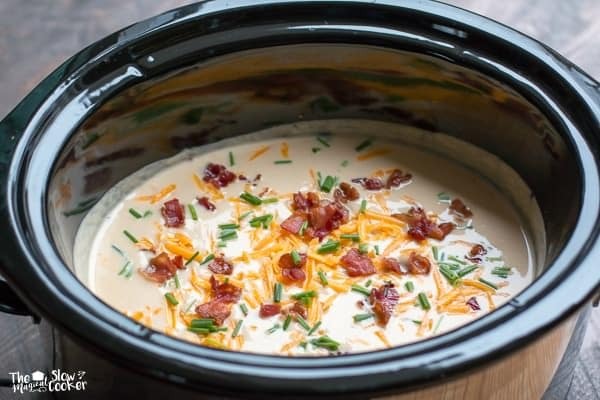 Cut the carbs with this delicious Slow Cooker Cauliflower Cheese Soup. So good topped with bacon and chives! I am starting my year off low in carbs and sugars. Naturally I am cooking most of my meals in the slow cooker still. This soup tastes like a cross between broccoli cheese soup and potato soup. 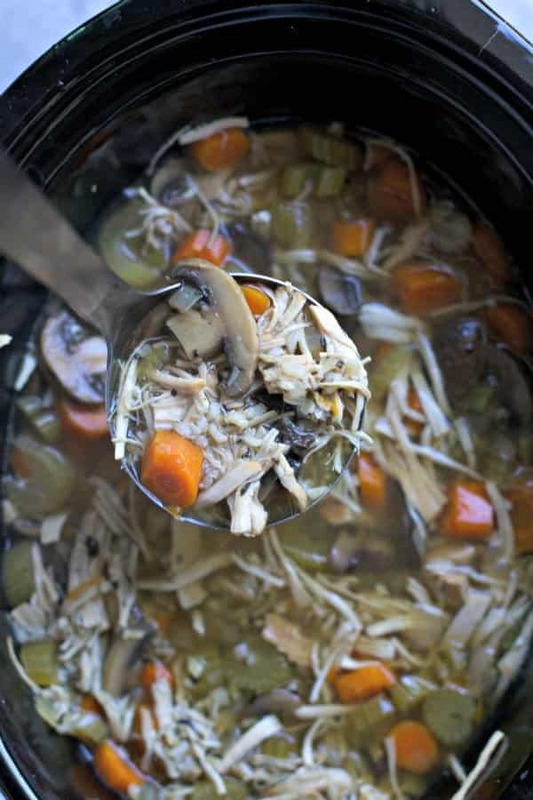 To make this soup it starts out by throwing the veggies in the slow cooker with chicken broth. Let that cook all-day. Then when it is time to serve dinner, blend it up and add shredded sharp cheese and cream. 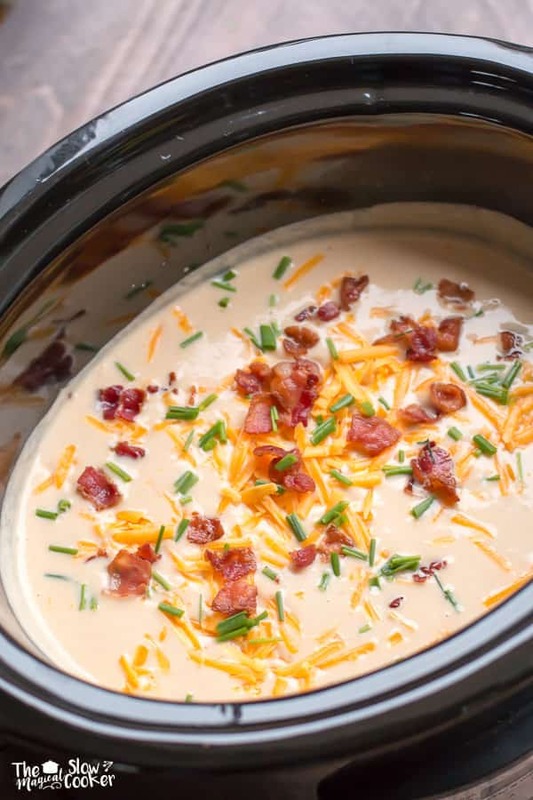 Top with bacon, chives, and more cheese. Try this one, even if you’re not cutting carbs, you will see how good low carb food can be! My husband loved this meal. I thought he would be mad thinking it was potato cheese soup. I will definitely be putting this meal on the menu often! 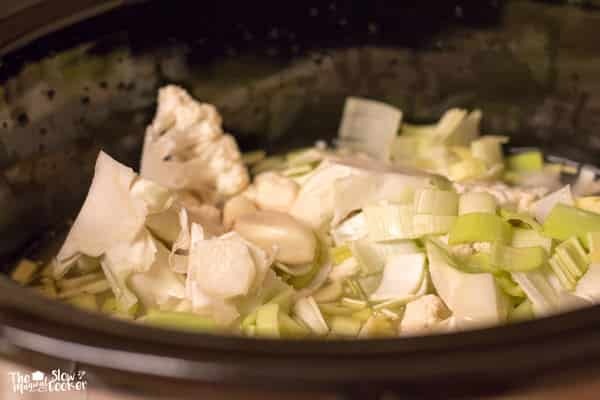 In a 6-quart slow cooker at the chicken broth, cauliflower, leeks, garlic and pepper. Add everything from the slow cooker in to a blender, cover and pulse until smooth. Add this back to the slow cooker. Add the shredded cheese and cream, stir. Now add salt to taste. I add about a ¼ tsp. Serve topped with bacon, cheese and chives. I don’t have that information, I’m sorry! As my husband and I don’t like GARLIC I find I lose interest in any recipes that has it included. Why is it used so much ? I’ll wager that most people love garlic. I know my husband and I do. Just leave it out of your recipe if you don’t. Will have to make this soup soon!! Looks scrumptious!! 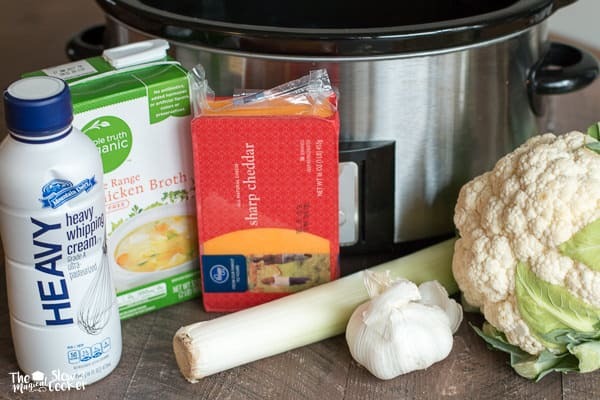 I absolutely love cauliflower and this soup sounds so good. I wonder how it would be if you made it with some of the purple cauliflower? Purple soup? I’ve got this recipe going in crockpot right now! I’m always on the hunt for new low carb recipes & this one looks like a winner!